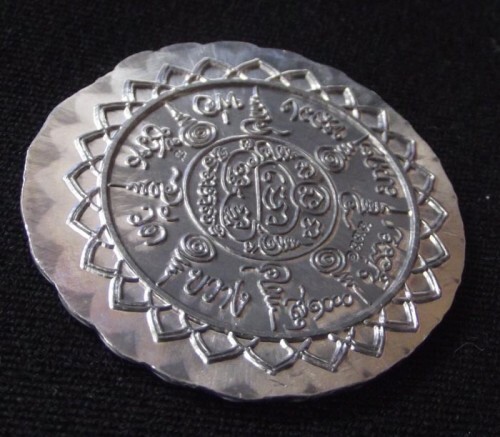 Luang Ta Chuan’s most famous and successful amulets are his first ever edition coin, and equally famous, the Rian Laekhasart (Lottery Ticket winner coin). The Rian Laekhasart is commonly known as ‘Rian Bai Huay’ or ‘Rian Hai Huay’. It has hained immediate fame due to the instant success of multiple cases of Devotees with the coin becoming Lottery Winners. The Coin is designe to improve your horoscope and lucky stars to open up the channels for winning. 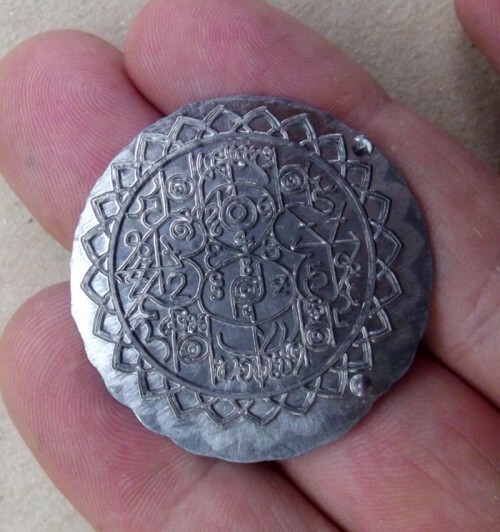 After the first edition of this amulet became completely sold out and unavailable, and the famous Lottery winning Oil was also all gone, Luang Ta decided to make one more edition of the Rian Laekhasart to cater for the still Massive number of people requesting this amulet. The amulets were made in 34 different Sacred Metals; Nuea Ngern (silver), Nuea Nava Loha (9 Sacred Metals), Nuea Dtakua Mai Dtat Khorb (Ancient Sacred Lead, with round, uncut edges – popular for its ease of use, and ability to chennel power, despite its rougher finish), and Nuea Tong Daeng Rom Dam (Sacred Copper alloy with black matt finish). 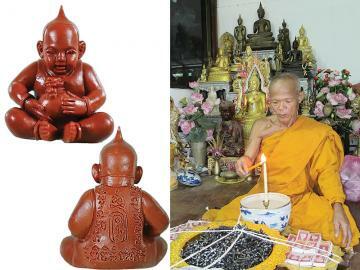 Luang Ta’s Wicha Hai Huay uses an Ancient Wicha that calls upon an Angelic Deva Intelligence to give winning numbers. 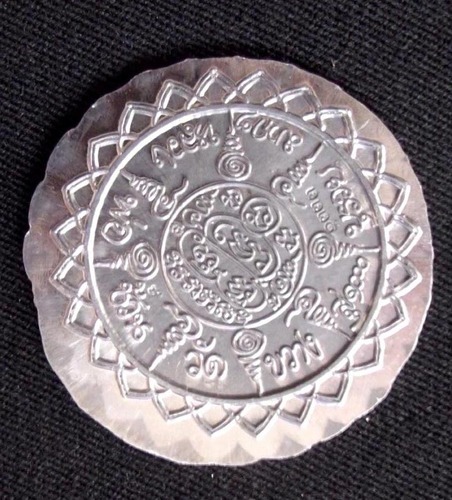 The Yantra and Invocations upon the coin form a connecting channel for the Deva to perform displays of power by blessing you with repeated winnings. Many devotees have reported that they have won repeatedly and consistently since they began to use the amulet. The first edition of this amulet is now extremely rare to find and also has a very elevated price with Devotees. This second edition is thus a wonderful second chance to get try out Luang Ta Chuan’s famous Lottery Amulet. If you get lucky success, you must make opfferings and give alms to the Sangha, and offer to share the Merits with the Deva of the Lottery Coin. Apart from winnings from gambling, the Deva of the Amulet will also cause Important or Helpful people to point the way to success or give excellent advice as to what courses of action to take to prosper in Business with ease, rapidly gaining riches. 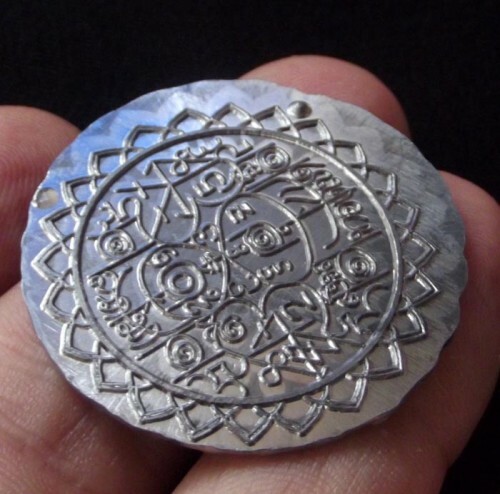 Sacred Yantra and Astrological Symbols are embossed on the coins, which have been designed with Optimal Astrological Invocations to guide your fate along prosperous and auspicious lines. Apart from Lotteries, the amulet is also able to be used for other forms of Numbers Gambling too. Luang Ta Chuan is a sure bet when it comes to respectable Lineage, the Looksit of Luang Por Muy, and was the Apprentice closest to Luang Por Jong of Wat Na Tang Nok, the friend of Luang Por Kasem (Wat Muang), the helper of Ajarn Fai (in making amulets). He learned the spell of Invisibility from his Master Luang Por Muy, and learned the Wicha of Sleeping in a Coffin to empower amulets. At the age of 71, he is still completing the construction of Wat Khwang Temple, a once delapitated and deserted temple which he stumbled upon 15 years ago. He has completed the building of the Main Kuti and Kuti huts for monks, an Uposadha Shrine room during the last two years and is working hard to develop the temple further. One day before the Lottery comes out, the owner of the amulet must offer incense and small size flower blooms, in the same numbers as the date, and lunar cycle day of the lottery. For example, if it is the 16th May, (The 12th Phase of the Moon), then use 12 Incense sticks, and 12 flowers. Or the 1st of June (The 13th phase of the Moon), then use 13 Incense sticks and 13 flowers.